Scientists at the Georgia Institute of Technology have discovered a new climate pattern called the North Pacific Gyre Oscillation. This new pattern explains, for the first time, changes in the water that are important in helping commercial fishermen understand fluctuations in the fish stock. They’re also finding that as the temperature of the Earth is warming, large fluctuations in these factors could help climatologists predict how the oceans will respond in a warmer world. The research appears in April 30 edition of the journal Geophysical Research Letters. “We’ve been able to explain, for the first time, the changes in salinity, nutrients and chlorophyll that we see in the Northeast Pacific,” said Emanuele Di Lorenzo, assistant professor in Georgia Tech’s School of Earth and Atmospheric Sciences. 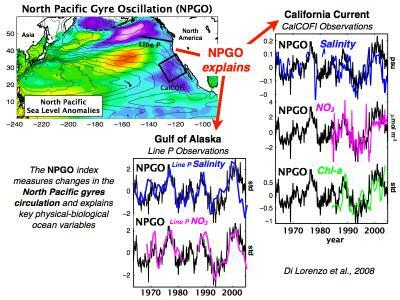 "Although the North Pacific Gyre Oscillation is part of a natural cycle of the climate system, we find evidence suggesting that its amplitude may increase as global warming progresses," said Di Lorenzo. If this is true, this newly found climate pattern mey help scientists predict how the ecosystem of the Pacific Ocean is likely to change if the world continues to warm, as predicted by the Intergovernmental Panel on Climate Change.